I don't make many predictions but I really think that Spotify will change music. 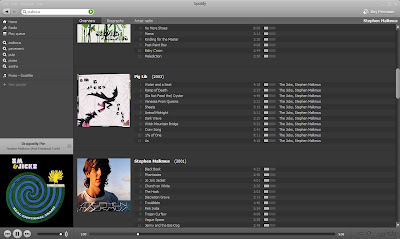 Developed by a group of folks from Sweden, it is a P2P streaming music application with a library of some 6 million songs that you can listen to whenever you have the app running (desktop or mobile). With minimal advertising in the free version, think of it as Hulu for music. Later this year, it will be availble to users in the US (licensing issues) including an iPhone app which could really affect the whole notion of paying for music downloads. Why is it so good? Well, you can listen to whatever you want, create playlists and even cache songs to listen to while you're not connected, but most importantly, the UI is clean and easy to use making the user experience great. Spotify has a good visual layout; screen density is low and navigation is inituitive and flexible helping users find music quickly. On the left side, for example, the Search box, recently saved searches and the album cover link each represent important navigation elements. Also, the Search box and 'New Playlist' link are very visible and prominent functionalities for users with those specific goals in mind. Although using the Radio filter is cumbersome (later post), overall, Spotify is nice and I'm really looking forward to seeing it on mobile devices soon. Can't wait for Spotify! Thanks for getting the word out Tom! Spotify will be great, but we'll see if it is the money-maker that people are anticipating. After all, how many people will purchase premium subscriptions for access to 320kb/s Ogg streams? How many people even know what Ogg Vorbis is? I don't think higher bitrates will be enough of an incentive to make people pay. I don't know what Ogg Vorbis is but it sounds slow. Although free is free. Since Pandora implemented their 'not so free, free' model charging 99 cents after 40 hours, watch for the lemmings to follow.